I mentioned in my other Pumpkin Soup recipe that I made these pumpkin soups for a friend's daughter. This one I made on the same day as the other one, as I wasn't sure which one she would like, as I had never made pumpkin soup before. She loved the unspiced one, my family however, preferred this one. This one adds a little spice with the cumin and coriander which I think works beautifully with the pumpkin. I chose to bake the pumpkin again as I did with the other Pumpkin Soup, as I find it adds a little extra flavour, and it is simple to do. But you can just cook it in the stock with the potatoes if you prefer. I don't like nutmeg, as I find it overpowering, so I don't use it, but if you do like it add it, as it was in the original recipe. 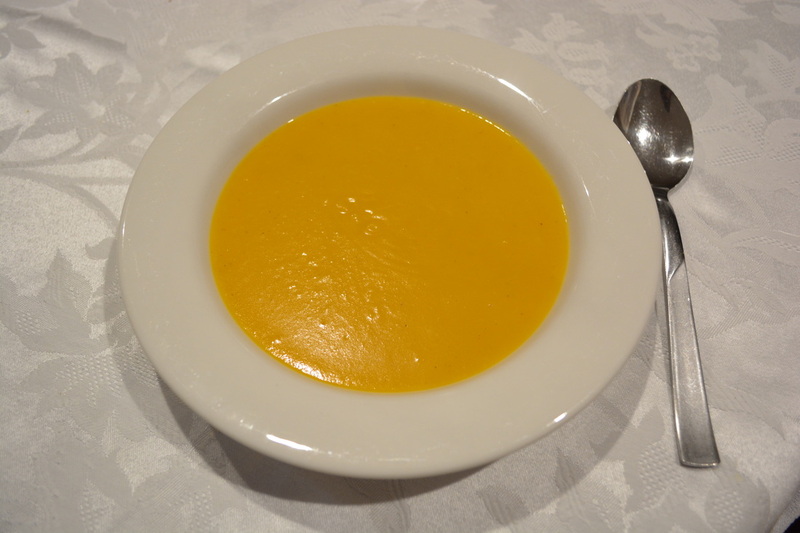 If you like a little extra flavour in your pumpkin soup, give this one a try. Heat the remaining oil in a large saucepan over low heat. Add the onion and leek, cook, stirring for 3 minutes, until softened but not browned. Add the garlic, coriander, cumin and nutmeg (if using), cook, stirring for 30 seconds. Place the pumpkin in the saucepan. Add the potato and stock, season with a little salt and pepper, bring to the boil, simmer for 20-30 minutes or until the pumpkin and potato are cooked through. Turn off the heat. Allow to cool slightly, then blend in batches (I prefer to use a stick blender in the saucepan, much easier, but you can miss a bit, but my family don't care). Return the soup to the pan, stir through the cream and reheat gently. Taste for seasoning. Serve with a little more nutmeg, if using.